Charles Wolfe, “Dave Freeman and County Records,” Bluegrass Unlimited, December, 1980. Fred Bartenstein was in high school and still too young to drive when he bought his first County record, Larry Richardson & Red Barker and the Blue Ridge Boys. It was in September of 1965, at the first multi-day bluegrass festival in Fincastle, Virginia. The album, David Freeman’s very first bluegrass release, had just been issued. Several months later, Bartenstein found his way to the world headquarters of County Records, a small room tucked into David’s father’s art business on East 37th Street, near the United Nations in New York City. In this unlikely circumstance, Bartenstein came to know a soft-spoken New Yorker who had instantly fallen in love with country and blues music on the radio during a family driving trip to Florida in 1953. David always wore work shirts and pants of matching colors (mostly green or blue). Until recently he had been employed by the Railway Mail Service sorting U.S. mail on trains, but he spent every free moment pursuing his musical interests. Whenever a southern artist appeared within reasonable distance of the city, Freeman was there. Since the late 1950s, he had been traveling to the South in search of records, listening to the radio, and attending concerts and fiddle conventions along the way. What started as a record-collecting hobby began to evolve into a group of related businesses. First came casual selling and trading of duplicates and less-desired records to make space for others. This grew into mail-order auctions and relationships with enough customers to attempt – in 1964 – a reissue LP, A Collection of Mountain Fiddle Music, County 501. Freeman pressed less than 500 copies, designing and printing the jackets with the help of his father, a commercial artist. He thought the name “County” would connote the rural associations and geographic distinctions of his favorite music. David Freeman shared a warehouse in Weehawken, New Jersey, with another Bluegrass Hall of Fame member – the late Bill Vernon – who introduced him to New Yorkers with a shared interest in traditional country music. These included Charlie Faurot, a traveling representative for a bank, and Tom Whitmore, a classical radio station’s chief engineer. In 1964, Faurot and Whitmore made field recordings of Wade Ward, Kyle Creed, Fred Cockerham, and George Stoneman in Galax, Virginia. They approached Freeman about releasing them, and so was born Clawhammer Banjo, County 701, the first in a series of new recordings by traditional artists. More historical and newly recorded albums followed, some produced by friends and others by Freeman himself – including Red Allen and Joe and Janette Carter’s Carter Family Favorites. The limited-edition releases took years to recoup their expenses and would not have been a viable business model on their own. 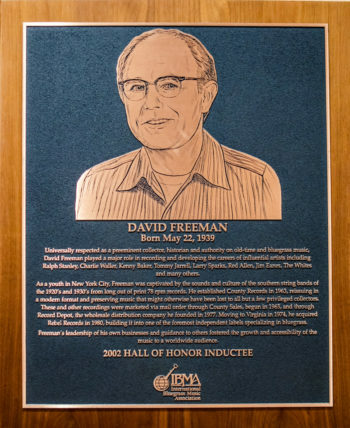 Freeman found that by selling and distributing the often-obscure releases of other labels – by mail order, and to specialty record shops – he could build enough volume to devote his full-time energies to rural music, and earn a modest living. His first customers were in the British Isles, readers of the magazine Country News and Views. The County Sales Newsletter (more than 300 editions have been published), sent to a growing list of North American and international buyers, became known for its comprehensive coverage and pull-no-punches reviews of available recordings. By the end of his first decade of operations, buyers in rural and small-town areas had replaced Freeman’s original big-city markets. Speedy service, reasonable prices, knowledgeable advice, and a comprehensive stock of recordings and related merchandise built County Sales into the dominant mail-order outlet for old-time and bluegrass music buyers worldwide. The Blue Ridge region, a mountain music mecca, called to the native New Yorker. When he saw a Floyd, Virginia, farmhouse advertised for sale, David Freeman began the process of moving his family and business operations to a county of less than 15,000 residents (but perhaps the world’s highest ratio of fiddles and banjos). In nearby Roanoke, he soon added Record Depot, a warehousing and distribution operation serving Virginia and adjoining states for thirty-five labels. The Floyd mail-order operation continues today; it is even an attraction on the Crooked Road: Virginia’s Music Heritage Trail. The Freemans have since relocated to university towns Charlottesville, Virginia (where label offices remain), and Chapel Hill, North Carolina. 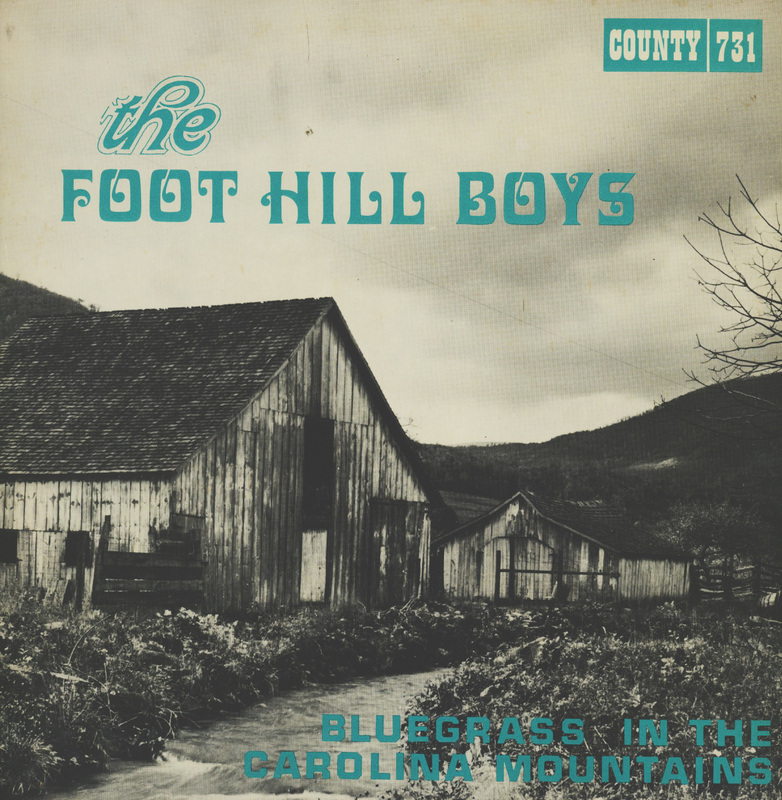 The County label continues its original vision of releasing reissues and the most tradition-oriented of new recordings. In 1978, as major labels continued to move away from bluegrass headliners, David Freeman helped Barry Poss to found Sugar Hill Records for acts with the greatest touring and commercial potential. In 1979, Rebel Records founder Richard Freeland decided to retire and sold his pioneering bluegrass label to David Freeman. Bluegrass and traditionally oriented country music have gone through countless changes – as have technology, media, finance, and marketing – in the five decades of David Freeman’s business career. Unique among his early peers, he has managed to weather the changes and evolve to changed conditions while never losing sight of his original vision: to produce and sell music he believes in. The Freeman enterprises have consolidated over the years. In 1980, David sold his interest in Sugar Hill Records to Barry Poss. In 2003, he sold Record Depot to an employee, Chet Rhodes. Son Mark Freeman grew up in the business and today manages most of the operations of County and Rebel Records. Web-based purchases and digital downloads account for a growing share of transactions. David Freeman continues to be involved, but can often be found at the pursuits that originally engaged him: collecting and auctioning rare artifacts from the early days of southern rural music. A pioneer in reissuing country string band recordings of the 1920s and 1930s and new recordings of tradition-oriented bluegrass and old-time musicians. Created and built distribution channels through which bluegrass and old-time music reached new audiences outside the American South and throughout the world. Set high standards for recording, documenting, and producing artist projects, raising the bar for the entire industry. Mentored others who made notable contributions to the recording field, including Charles Faurot, Richard Nevins, Barry Poss, Chet Rhodes, Gary Reid, and Chris King. Produced hundreds of influential bluegrass releases by artists including Ralph Stanley, Ricky Skaggs, Kenny Baker, Charlie Waller, Larry Sparks, Red Allen, Rhonda Vincent, Lonesome River Band, IIIrd Tyme Out, Blue Highway, Ronnie Bowman, Lost & Found, the Forbes Family, Claire Lynch, and Del McCoury. IBMA Award of Merit (Distinguished Achievement Award), 1989. Bluegrass Hall of Fame, 2002. Holds a degree in Classics from Columbia University. Played mandolin and sang baritone with Southern Express in New York/New Jersey and backed fiddlers on several albums. Has sold and/or produced recordings in every technological format introduced during the fast-changing 20th and early 21st centuries. His personal passion continues to be collecting the 78 and 45 rpm recordings and song and picture books sold by early country artists. 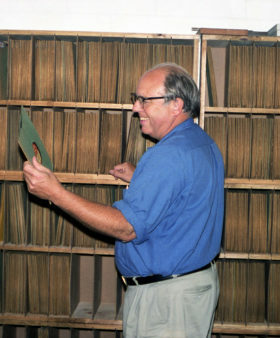 Son Mark Freeman has taken on many of the day-to-day operations of County and Rebel Records. From the Archives: Original recording of 12 tracks recorded in Mt. Airy, North Carolina by Charles Faurot and produced by David Freeman. Donated by Henry Horrocks. 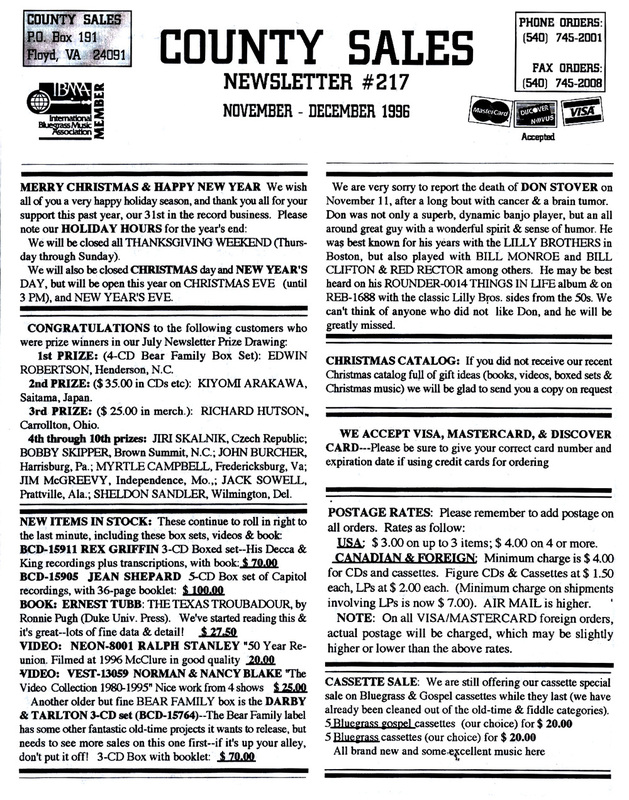 From the Archives: County Sales Newsletter # 217. Nov./Dec. 1996. Donated by Ron Green. Robert Carlin, “The Small Specialty Record Company in the United States,” John Edwards Memorial Foundation Quarterly, Summer, 1976. Scott Perry, “David Freeman and County Sales,” “Don’t Start Me to Talkin’, I’ll Tell Everything I Know” Blog, Floyd, Virginia, April 6, 2008. Marshall Wyatt in “Every County Has Its Own Personality,” The Old-Time Herald, Volume 7, Number 2 (1999). Stay up-to-date with the Hall of Fame!